Cook the potatoes in salted boiling water until just tender but not mushy. Drain the potatoes. When potatoes are cool enough to handle, cut each one in half lengthwise and transfer to a large bowl. Or if the potatoes are on the larger side, cut into thick ½ inch coins. Toss with 2 tablespoons olive oil and season with salt. Combine remaining olive oil, parsley, shallots, chives, mustard, and vinegar in a large bowl. Heat a grill to medium. Clean and oil the grilling grate. Place potatoes cut-side-down and cook, turning occasionally, until well-browned and grill marked on both sides, 5 to 8 minutes total. 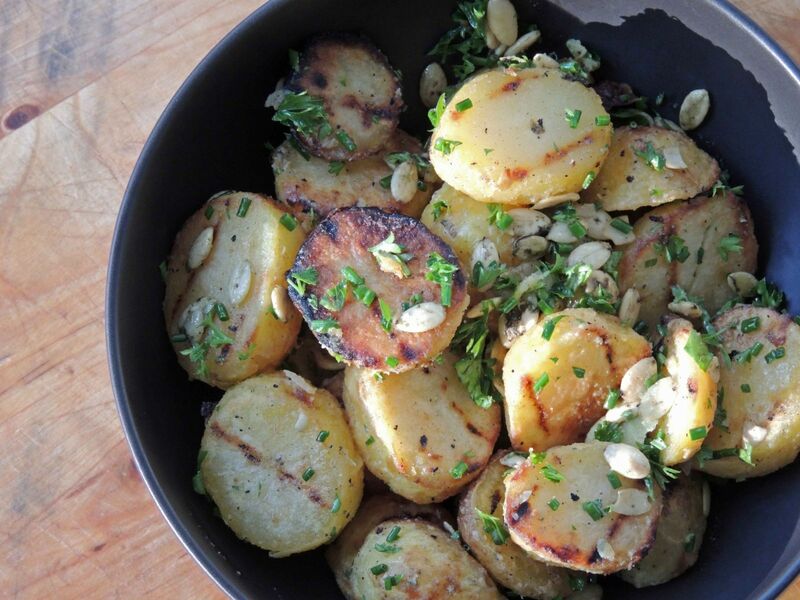 Transfer grilled potatoes to the bowl with the olive oil and herb mixture as they finish cooking. Toss potatoes with the dressing and pumpkin seeds. Season to taste with salt and pepper. Serve immediately. ﻿*To toast pepitas: heat a small heavy skillet over medium heat. Add in the pepitas and stir for about 4-5 minutes until they become fragrant and start to brown a little. Pour into a bowl to stop the cooking or add directly to your salad.